3 strand synthetic hemp rope, which looks and feels similar to traditional hemp rope. Often referred to as "Hempex" or "Hardy Hemp". It is easy to grip and is soft on the hands. It has excellent breaking load, good resistance to abrasion and will not rot. Low stretch and easy to splice. Ideal for garden projects, decking, handrails, garden swings etc. Also used on board traditional sailing vessels. Available in cut lengths or in 220 metre coils. Braided Synthetic Hemp Rope. Natural Looking Cord Available in either 3mm or 4mm Diameter. 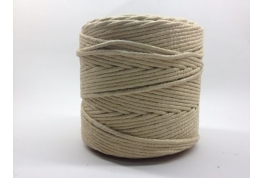 4mm Synthetic Hemp Rope looks and feels similar to traditional hemp rope. Also referred to as Hempex Rope, Hardy Hemp or Polyhemp Rope. Tarred synthetic hemp spun yarn is an ideal alternative to traditional tarred marlin without the mess. Tarred Polyhemp maintains the look of a natural fibre whipping twine. The approximate diameter of our tarred spun yarn is 4mm and each spool is around 340 metres long. 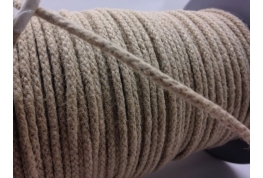 6mm Synthetic Hemp Rope looks and feels similar to natural hemp rope. 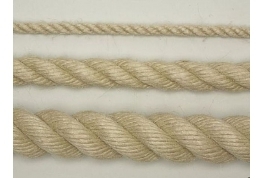 Often referred to as Polyhemp rope or Hempex rope. This synthetic rope is considered to be low stretch and will not shrink, swell or rot when it gets wet. Ideal for any outdoor rope project where a traditional rope look is required. 8mm Synthetic Hemp looks & feels similar to natural hemp rope. High strength and very low stretch. Suitable for use as decking rope, rope handrails and almost any garden project. 3 strand synthetic hemp rope, which looks and feels similar to traditional hemp rope. Often referred to as "Hempex", "Hardy Hemp"or "PolyHemp". It is easy to grip and is soft on the hands. It has excellent breaking load, good resistance to abrasion and will not rot. Low stretch and easy to splice. Ideal for garden projects, decking, handrails, garden swings etc. Also used on board traditional sailing vessels. 3 strand synthetic hemp rope, which looks and feels similar to traditional hemp rope. Often referred to as "Hempex" or "Hardy Hemp". It is easy to grip and is soft on the hands. It has excellent breaking load, good resistance to abrasion and will not rot. Low stretch and easy to splice. Ideal for garden projects, decking, handrails, garden swings etc. Also used on board traditional sailing vessels. 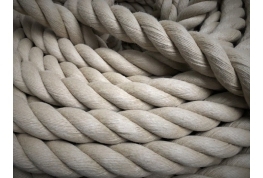 Synthetic Hemp Rope, which looks and feels very similar to traditional hemp rope and often referred to as "Hempex" or "Hardy Hemp". It is easy to grip and is soft on the hands. Synthetic Hemp Rope has excellent breaking loads, good resistance to abrasion and will not rot. Low stretch and easy to splice. Ideal for garden projects, decking, rope handrails, garden swings etc. Also used on board traditional sailing vessels. Copyright © 2019 Cheap Rope. All Rights Reserved.